One of the highlights of the COP23 in Bonn was Bertrand Piccard’s event on the launch of his new initiative. Joined by Prince Albert II of Monaco, Patricia Espinosa (Executive Secretary of the UNFCCC), Maroš Šefčovič (Vice President of the European Commission), and many other personalities, the famous Swiss pilot and his team presented the World Alliance for Efficient Solutions, which aims to select 1,000 sustainable and profitable solutions from around the world and bring them to decision-makers to encourage them to adopt more ambitious environmental targets and energy policies. We were really happy to sit down with Bertrand Piccard, and took this opportunity to ask him everything we ever wanted to ask him, starting with his grassroots commitment to the planet, to his opinion on policy-makers fighting climate change. In this inspiring chat, Bertrand also gives personal advice for all those out there who are trying to change the world, one idea at a time. Coming from a family of explorers and innovators, can you tell us a little bit more about the influence that your father and grandfather have had on your life commitment to the planet? Caring for the planet was a concern for all the generations of my family so you could say I was kind of born with this. In 1931, my grandfather made the first flight to the stratosphere to test its pressurised capsule. 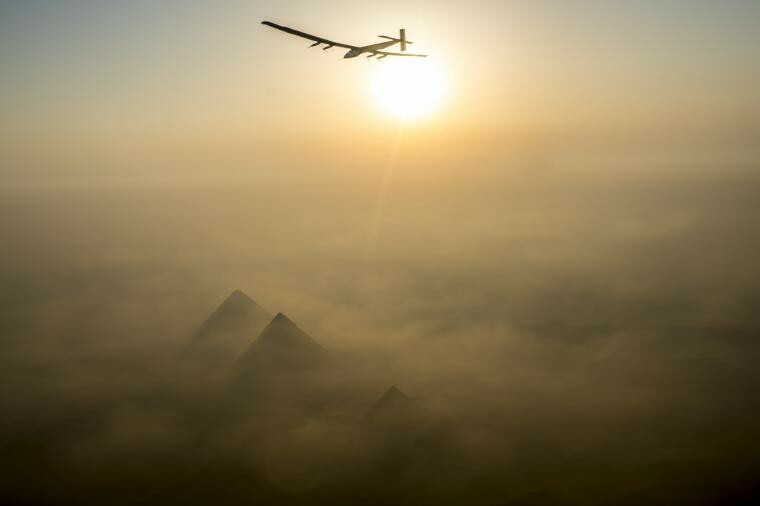 One of his goal was to demonstrate that it was possible to fly above the bad weather, in thin air, and consume less fuel. His theory was that flying at a high altitude would be more ecological. Then in 1960, my father dived to the bottom of the Mariana Trench, 11km down with the bathyscaphe. At that time, the government wanted to dump all their radioactive and toxic waste in the ocean, but because they saw a fish and could prove that there was life down there, it was the beginning of the ban of dumping dangerous waste into the ocean. My father later made a submarine to study the Gulf Stream off the coast of Palm Beach, Florida. It was 1969 and he already knew it was vital for the climatology of Northern Europe. Everything they did was really to bring scientific exploration to protect the environment, and because of all these examples I had when I was a child, it has always been normal for me to just care for the planet. 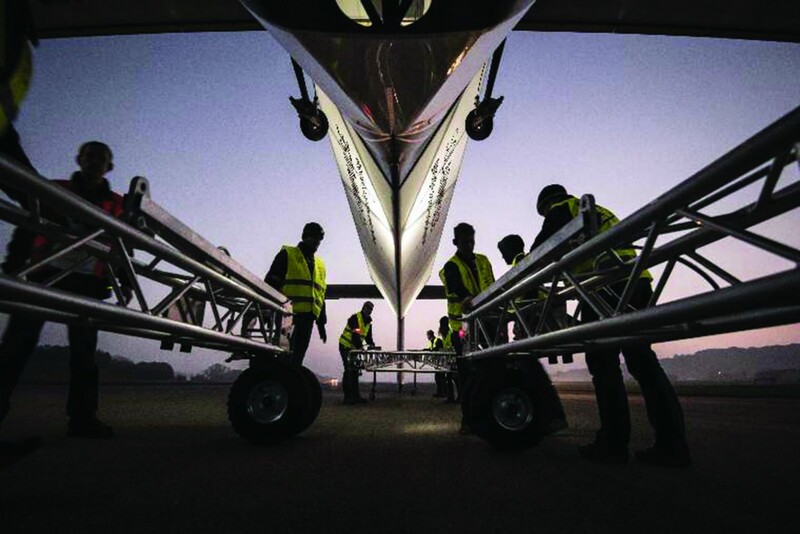 You are yourself an explorer and innovator, bringing about the first round-the-world solar flight in history. I’m guessing you had to overcome a lot of obstacles in the process. What kept you going in these doubtful moments? 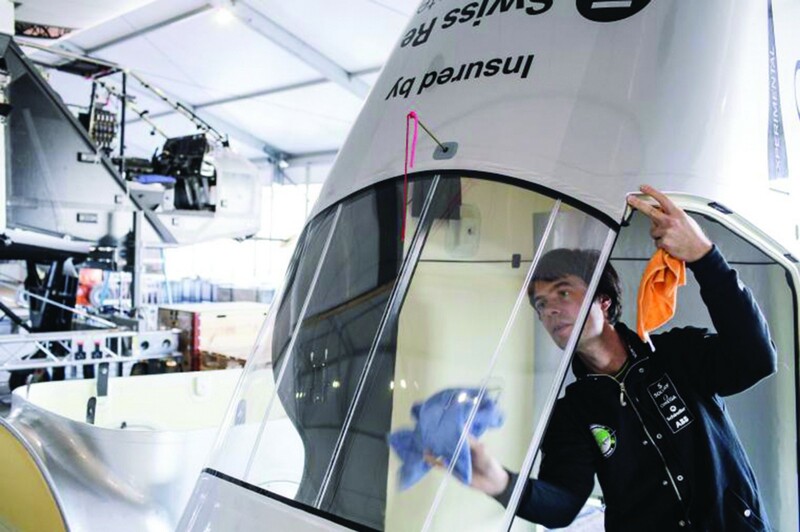 Maybe the sentence that I said the most to my team and to myself during the Solar Impulse years was: “If it was easy, somebody else would have done it already”. This is the pioneer state of mind. I’m a pioneer and an explorer, just like my father and my grandfather were. Our passion is to explore ways that nobody had explored before, it’s to do things that nobody had done before. But the most important part is to always do so in meaningful way, to always have a purpose. The sole purpose of the solar flight was enough to keep me going. We were demonstrating that clean technologies and renewable energies can achieve impossible goals, and we showed that we could do better without fuel than with fuel. If you fly with the energy of the sun instead of the energy from fuel, you don’t need to land and refuel, you can fly theoretically forever. So you could say that what kept me and the team going was really to bring this message to the world that we have technological solutions that can be useful for the environment. And that’s also the goal of the World Alliance for Efficient Solutions, right? To bring innovative solutions to the attention of a greater number. You are right. There are thousands of solutions that exist today and that can protect the environment in a profitable way. Unfortunately, they are not used, they are not implemented because they are not known. Most of them are hidden in startups and research labs, sometimes also in big corporations. That’s why we are stuck with old systems, outdated and inefficient industrial processes, and bad ways to produce and distribute energy. But this is not normal. What I want to do today with the World Alliance for Efficient Solutions is to bring together the people who are making solutions, the investors who are looking for opportunities to invest and the people, institutions or public authorities who are looking for solutions. Our goal is to offer all the matchmaking and network for free. 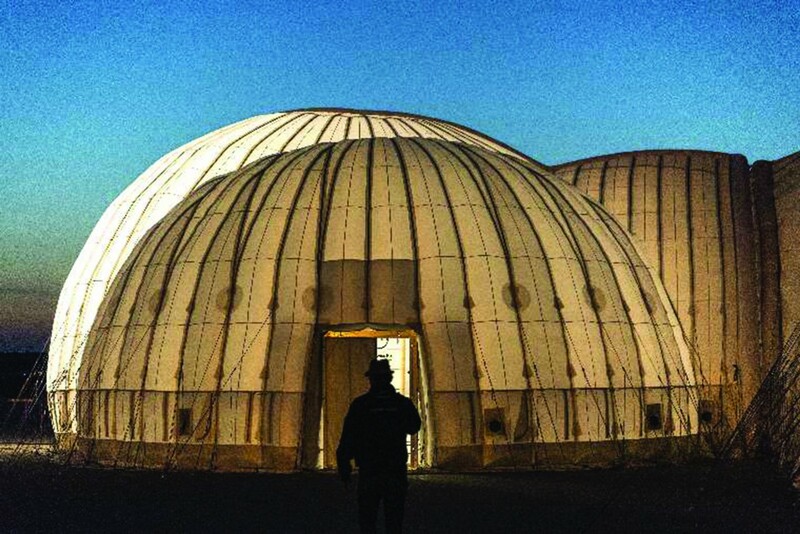 We are now selecting the first 1,000 of these solutions that protect the environment in a profitable way, in order to bring them to heads of states, big corporations or institutions, to show them that they can be much more ambitious in their energy policies or their environmental targets. What makes a good idea a good solution? A good solution works on two aspects. The first one is the protection of the environment, whether it is about energy efficiency, saving natural resources, or improving quality of life. The second very important aspect is that it needs to create jobs, to be profitable and to allow industrial and economic growth. Half of the energy we use today is just wasted because the systems are not efficient. So every product, process, program or technology that can help us to be more efficient that what we already have, if it is profitable, can apply for the 1,000 solutions. It can be new material for insulation, new technologies to produce cars that use less energy, new industrial processes, new ways to heat or cool down houses, new ways to produce or distribute energy, and so on. All these solutions represent a huge industrial market, and that’s how we will gain the interest of many major key decision makers and large companies. And on the other side, they contribute to protecting the environment, and they save natural resources. Those are really the two pillars on which the selection of these solutions is made. It is really important today to demonstrate that the protection of the environment can be profitable. It is not something that will require sacrifices from anybody, but rather something that will bring advantages, that will bring profit and job creation. But we need these solutions to come out of the shadows. How important is the diversity of solutions and also entrepreneurs you are selecting? We try to have solutions from everywhere. It’s clear that the amplitude of the solutions is different depending on the continent. For instance in Germany you have might have a company which is building wind blades for wind turbines that can double the life expectancy of the wind turbine. So that’s a really industrial example. In Africa or India, very often solutions we encounter are not so industrial. For example, we have one member from India who has invented a system to purify water in houses. Also in India, there is a startup that is using the same system as the engine of the Solar Impulse, in order to make ceiling fans and save 75% energy. So there are different levels, but the important thing to remember is that everybody can be inventive. And this is what I found exciting, how much passion and how much pleasure these innovators have. Most of them will dedicate their life to their invention, and they will do everything in their power to make it a success, and we’re there to help them. What advice would you give to an entrepreneur who is trying to grow his sustainable business today? They have to be a pioneer, they have to change the paradigm. They have to change the usual way of doing things. If we are in a deep trouble today it’s because we continue to do things without challenging our habits, our way of thinking and our certitudes. We just do business as usual without noticing what’s happening in the rest of the world, what happens to the environment, what happens to natural resources. It really is a short term view. So entrepreneurs have to think out of the box, they have to observe what exists today and change what there is. Just change it! You know the guy who is working on the ceiling fans in India, it’s interesting because fans on the ceiling have existed in India for a hundred years, but this man thought “I’m going to change the type of engine that activates the fans so it will be 75% more efficient”. And that’s how he’s successful. You always need to look at where is the problem that prevents you to move ahead. If you work on that problem, you will improve the situation. You need to be curious, you need to challenge your certitudes, you need to have a lot of doubts, because only the doubt is creating the creativity. Finally, it’s very important that you look at everything that protects the environment under the angle of profitability. Because if you only look on how to protect the environment with subsidies or with big expenses, your company or your new product will not be successful. Do you feel like decision makers are not doing enough to fight climate change? The decision makers today are looking for the smallest common denominator. They are clearly trying to find the minimal consensus, the lowest point where everybody agrees to agree. But this is not ambitious enough! They take into consideration only the old technologies that we still use today. So what I want to do now is to show them that we can be, or they can be, much more ambitious in their environmental targets, and in their energy policies. They can easily create regulations that are much more modern. I’m not asking for more regulations, I’m just asking for modern regulations that take into consideration the new technologies that allows houses to be energy neutral, cars to use much less energy, new ways to distribute, produce and consume energy, new industrial processes. All this has to be taken into account in order to pull the innovation on the market. The problem today is that the normal way to do things is to push innovations. So there are a lot of subsidies for innovations, in universities for instance, with grants for startups and so on. So we end up with a lot of patterns, which is great, but it’s not enough because you never know where the patterns are going. So what you need to do today is to pull innovation by need. And the best need to push innovation to the market is regulation. If it is prohibited to waste energy, all the energy efficiency devices will come in the market. But as long as it is allowed to pollute, to waste energy, all the innovations will remain in the startups and will not come to the market. How do you explain that it’s still like like this today? Because they are afraid to change too fast and because they don’t know the solutions that exist. It is a lot about the lack of information. I have been working in this field of clean technologies for 15 years, yet, everyday I have a new surprise with a new technology that comes, with a new process, with a new product, and I’m thinking “Wow, genius! How did they get to that?”. So for a politician who has to manage so many things, of course they don’t know what exists in the startups and in the labs. So my task is to make them aware of it, but also to do it in a very mediatic way, very official way, very public way, in order for the decision makers to be obliged to use these solutions. How optimistic are you about things really changing in the coming years? There is a momentum now. Unfortunately the momentum is more about awareness than actions. And awareness is not enough. So what I want to do is to bring the solutions to be able to act, to be able to change. So I am very optimistic when I see how many solutions exists but I have to say that I am a little bit pessimistic when I see how much time it takes to implement them, and the lack of courage that decision makers have. What we need now in the political world, is to have leaders, not only managers. The governments today, they just manage the country; they don’t lead, they don’t show a vision, they don’t explain why we have to do things, or what is the purpose of what we have to achieve. What would you like to tell our readers who are entrepreneurs? I would tell them that if they want to motivate somebody, they need to speak the language of the other one, not their own language. And this has been a problem for years with ecologists, who were trying to convince the industry by speaking the language of the environment. But it’s wrong. If you want to speak to people in the industry, you have to speak the language of industry, you have to speak the language of money, of job creation, in order to bring the solutions for the environment. So this is really one important thing: speak the language of the one you want to motivate. The other thing is: be a pioneer, get out of what you have learned, get out of your certitudes, of your habits, of your beliefs. You will only be creative if you embrace the unknown. Because the unknown is what will stimulate your creativity and your performance; not your habits and your beliefs.